dentinogenesis imperfec´ta a hereditary disorder of tooth development, transmitted as an autosomal dominant trait, and characterized by discoloration of the teeth, ranging from dusky blue to brownish, poorly formed dentin with an abnormally low mineral content, obliteration of the root canal, and normal enamel. The teeth usually wear down rapidly, leaving short, brown stumps. an autosomal dominant disorder of the teeth characterized clinically by translucent gray to yellow-brown teeth involving both primary and permanent dentition; the enamel fractures easily, leaving exposed dentin, which undergoes rapid attrition; radiographically, the pulp chambers and canals appear obliterated and the roots are short and blunted; sometimes occurs in association with osteogenesis imperfecta; autosomal dominant inheritance. 1 a genetic disturbance in the consistency of the dentin, characterized by early calcification of the pulp chambers, marked attrition, and an opalescent hue of the teeth. A form of dentin dysplasia. 2 a localized form of mesodermal dysplasia affecting the dentin of the teeth. It may be hereditary and associated with osteogenesis imperfecta. 3 a genetic condition that produces defective dentin but normal tooth enamel. Also called hereditary opalescent dentin. 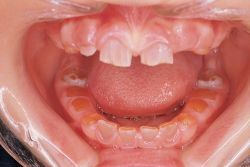 A common (1 in 6–8,000) inherited disorder of tooth development (OMIM:125490), which is characterised by blue-gray or yellow-brown translucencies of the teeth. Dentinogenesis imperfecta is caused by mutations of DSPP, the gene that encodes two key proteins of the dentin extracellular matrix: dentin sialoprotein and dentin phosphoprotein. A hereditary disorder of the teeth characterized by translucent gray to yellow-brown teeth involving both primary and permanent dentition; the enamel fractures easily, leaving exposed dentine that undergoes rapid attrition; radiographically, the pulp chambers and canals appear obliterated and the roots are short and blunted; sometimes occurs in association with osteogenesis imperfecta. Dental disorder characterized clinically by translucent gray to yellow-brown teeth involving both primary and permanent dentition; such enamel fractures easily, leaving exposed dentin, which undergoes rapid attrition. Synonym(s): hereditary opalescent dentin (1) . n (hereditary opalescent dentin) 1. a disturbance of the dentin of genetic origin; characterized by early calcification of the pulp chambers and root canals, marked attrition, and an opalescent hue to the teeth. n 2. a localized form of mesodermal dysplasia affecting the dentin of the tooth. It may be hereditary and may be associated with osteogenesis imperfecta. n 3. a hereditary condition associated with a defect in dentin formation; the enamel remains normal. disorder of tooth development characterized by discoloration and early wear of all teeth.